Here's my big bowl of homecooked ginger & sesame oil kidney and liver soup. They say preggers cannot eat so much liver, as too much Vitamin A can harm the baby, but, I could not resist the temptation when I think of pork kidney & liver. Thus, I asked my MIL to buy me some kidney & liver from the market so that I can make my favourite bowl of ginger & sesame oil goodness. My recipe is simple. Wash well your innards. Then ginger and garlic (optional) sauteed in sesame oil. Add water (you don't need chicken stock). Add some oyster sauce, soya sauce, that's it. Let it simmer, then off the fire. Yes, off the fire, then chuck in the kidney and liver. Make sure they don't over cook. Remove pot from the stove, the innards will continue to cook inside, don't worry. They also say preggers cannot eat so much tuna. But I have been eating tuna sandwiches every morning for the past 3 weeks. Hmmmmm. I have been also drinking old cucumber soup, bitter gourd soup and lots of icy drinks and rock sugar too. Maybe cincai already, 3rd pregnancy ma. Ok, time to control my diet. Bye. So now u in your 18th week pregnancy? wow, delicious. I had lots of this type during my confinement time. I love kidneys too, and I had this almost everyday during my confinement too..
Now no more MK, they usually drive out, I just tag along.. Mamak crowded.. One day I go your office visit you la..
What a happy and lucky day to see your blog updates!!! You should post often please as this blogsphere is turning into a real morgue with so many missing bloggers. What a greedy mama to eat everything! I can never get pregnant so I wouldn't know how to advise you anything here. I would say just eat everything moderately lah, both mummy & baby will be happy! I will come back again tomorrow to see your new post!! Wah, tomorrow ahh? Not so fast la, haha.. But I know you are getting faster and faster-er now.. Yeah, I also told myself, everything in moderation ok kua.. They say cannot eat so much tuna due to the mercury. No old cucumber soup or bitter gourd soup or any "kua" veggies coz it's "liang"..
No half boiled eggs due to the bacteria, yada yada..
Hi Mummy!!! I see a spiderman here growing cob webs! OMG!!! I want!!! I know I would love love that so so much!!! Have to risk a gout attack after eating all the innards but who cares! So far so good...touch wood! You should cook your own and blog about it.. I want to see your recipe.. Can learn from you too..
Yep, everything in moderation.. Lastime for the first pregnancy, wah, this cannot, that cannot, ba ba pai pai oohhh..
Then second pregnancy, errr, can la, curi-curi eat little bit..
Now ahh, don't care jor loooo, terus sapu !! Hi Louiz! I am so happy to see your update :) Aiyo, I will sure sapu the whole bowl if you put it in front of me! I love kidney and liver, especially liver. And if it is cooked just nice, it will be so tender and sedap. So just off fire and put the liver/kidneys in. eh? Worried also about bacteria but if the innards are fresh and properly cleaned it should be alright. I am not into pantang larang, I always believe that any nutritious food is good. Just exercise moderation and you will be fine. I think this weekend I wanna go buy liver hee..hee.. The innards were fresh, according to MIL.. But, nomatter how fresh, how clean, there will still be a bit of blood when you cook them in the soup (off fire).. I still sapu-ed, maybe not good for me, but errr, already eaten, buurrrppp.. hehe.. Enjoy your pregnancy! 3rd time's the charm they say. :D And dont worry what you eat as long as you know you're fine, plus the monthly checkup also you'll know the baby is fine right? so excited! Hehe, yeah, I still watch out what I eat, but not so fussy already like this cannot that cannot.. They say your cravings is an indication of what your body lacks in during pregnancy. So eat what you want as long as it's in moderation. Yep, everything in moderation.. I even curi-ed a few slices of pineapples to eat from the fridge.. I don't believe in "this cannot eat, that cannot eat" during pregnancy, well, except certain food like deli meat and sashimi la..
hmmm, you like to eat this ah?? errr, sorry ah, me really not ngam all those "noi jorng" one woh, when eat pork noodles also i will ask to have only the meat and not the innards ga woh.. but i didn't know during pregnancy you also cannot eat all these leh, but i think during confinement this will be your sort of "staple food" and you will eat this every meal every day.. Many people don't eat innards, I un.. Especially the kidneys, coz they say got one type of smell.. I shall be specific, it's the urine smell, I admit.. But if you really clean them well (my previous confinement lady soak the pieces in ginger water), ok wor.. But I didn't soak them in ginger water la, I just wash it and soak in tap water.. Nomatter how clean, how fresh, still got that smell one I tell you.. I try la, one post per 2 weeks or more.. Human hor, hai kam ger wor, stop liao a moment hor, lazy jor wor.. Although got a lot of things can write (my pregnancy stuffs, kun yam ping issues at work, depression, simple and dumbo baking/cooking), still feel lazy a bit jor wor.. Hmmpphhh..
Oh..you are back to blogging. Well, just eat carefully and take all the vitamins your gynae give you. hahah... I am one who will puke if I consume spare parts like liver and kidneys. But I guess it's good for you. I like the soup, I can drink all, but it's gonna be very heaty if I finish everything, coz it's made from lots of ginger and sesame oil.. Everything in moderation ya..
Take in moderation. Liver is high in iron. Yes, now no more liver.. Just that day..
Good to hear from you! Tasty big bowl! Not over cooking is the key to tasty innards. Yes, you are right.. Thats why I off fire after putting those in.. Sedappp.. But can't take too much.. Awesome! This is the kind of food I crave for too. I love pork liver (kidneys are rarer, seldom see them, not sure why). I've seen pig liver in supermarkets though. Liver cannot eat too much, and frankly, mum says nowadays, nobody wants to eat liver already, coz they are dirty wor.. But I still eat anyways.. I love to eat pig liver! 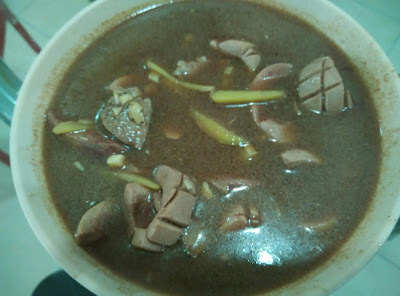 It's what we eat together with kampua, pig liver soup. It's very good if they don't overcook it. I think all livers cannot eat too much (too many vitamins which are fat soluble and you can overdose from) but generally should be okay if you don't eat everyday. Oh izzit? I thought kidney and livers are cheap stuff, coz nobody wants to eat them nowadays.. Kidneys, yes.. But liver, my mum says nobody wants to eat due to health consciousnesses..
yum yum. cooking method make it sounds delicious already. Ginger and sesame oil already very hoiwai..
Nice to hear from you at your blog. Cooking can be sianz when you are pregnant but at least your MIL has helped with you with the marketing. Funny that you said that you are cincai now with your food. Ai ya must be careful mah. Liver and kidney, yum! But can spike cholesterol reading though when taken in excess. The trade-off is it is a great source of iron (liver) - esp suitable for pregnancy, I suppose. Sardines are good too - great source of iron and calcium. Mercury? Any fish has it too if it's from the ocean. Everything in moderation is a safe bet. Take care there, Princess..